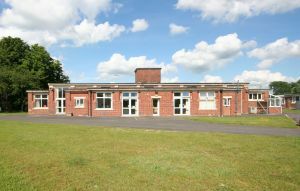 The Meadows comprises a detached, single storey, modern office building within the picturesque setting of Dean Hill Park. The building is situated at the entrance to Dean Hill Park and has central heating, perimeter trunking, fitted carpets and Category II lighting. The building is served by a fitted kitchen and male and female cloakrooms. The building has allocated on site car parking, with 26 car parking spaces. There is excellent on site car parking in the adjoining car parking areas.